Q.What does printed head shots mean? A: Printed is referring to the photos need to be printed and mailed to the ASR with the Application for Sheep Registration/Transfer in the North American Babydoll Southdown Sheep Association and Registry for initial registration or just the Certificate of Registry (CoR) if a transfer is being completed on a sheep already issued a CoR. One can have them printed at a photo center or they can simply be printed on ones home printer using copy paper. Or, as an alternative, the photos can now be electronically submitted to the ASR via e-mail for $0.50 per page. Include a Work Order and Fee Schedule and use Section I.
Q. How is a photo of a lamb and a photo of that lamb as an adult going to aid in positive visual identification? The sheep's looks change too much from lamb to adult. A. It is the ear tag being used for identification NOT the looks of the sheep. Q: If I use my farm tag to register the sheep, can I take it out and insert the scrapie tag in the same hole when I sell the sheep? A: If your personal farm tag number is what was used when the sheep was registered and the farm tag number is what is listed on the CoR, this must stay in the sheep’s ear. The scrapie tag will have to be an additional ear tag. If one wants to remove their personal farm tag when selling the sheep, then a new head shot must be taken showing the scrapie ear tag and a duplicate certificate of registration ordered. 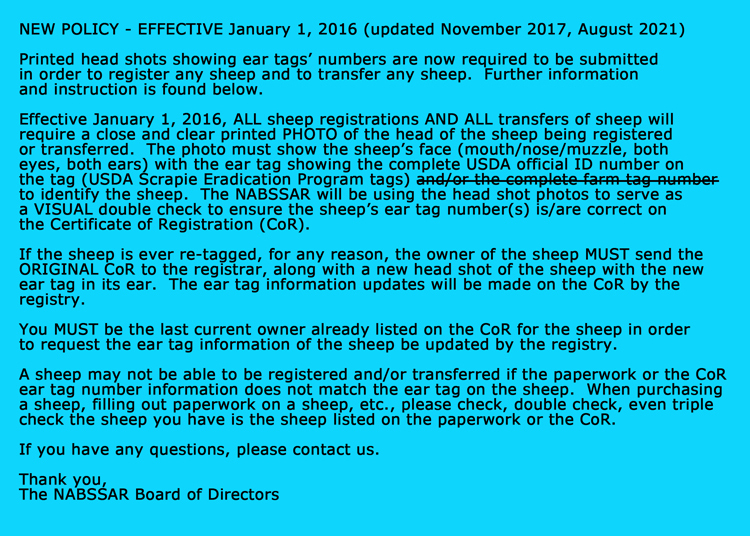 As stated in the policy, the last current owner listed on the CoR is the only one able to request the ear tag information of the sheep be updated by the registry. As stated, we recommend using the scrapie tag for the registrations rather than the farm tag. Q: Why ear tags and not some other form of identification? A: Most people don’t have access to a microchip reader to read chips to identify their sheep. Tattoos fade with time. DNA Genetic Identity has been suggested. This would be a costly and time consuming alternative. Each time one needed to prove the animal was a specific animal a new sample would have to be submitted and tested. At the current time, the NABSSAR feels ear tags are the best way for identification. Q: I can’t catch my lambs to take a photo. A: Take the photo when you’ve already caught them to put the ear tag in or give them their immunizations, etc. This way, it is one less time you have to catch them. Q: I don’t have anyone to help me take photos. It can’t be done with only one person. Put a halter on the lamb, in a couple of minutes they stop fighting it and you can snap a photo. Put the lamb in a lambing pen sized pen and wait until they look at you and snap a photo. Make a box out of hog panels that has a cover that hold them in but they can poke their heads out. When they do, snap a photo. Take a “selfie” of you and the lamb using your smart phone. Pick the lamb up and hold it. Then edit yourself out or don’t. Q: When does a new photo need to be used? A: A photo is required for initial registration. This same photo can be used IF the registration and the transfer to the first new owner are being completed by the BREEDER/SELLER at the exact same time. If a transfer is being completed by the BREEDER/SELLER at a later date than the initial registration, the photo needs to be a NEW photo, not the one used for the registration. If the transfer is being completed by the BUYER, the photo needs to be a NEW photo, not the one used for registration by the breeder/seller or one taken by the breeder/seller. Information on now to register sheep can be found here. Q: Can I e-mail my photos? A: The photos need to be printed and mailed to the ASR with the required paper-work. OR for a fee of $0.50 per page, the photos can be electronically submitted to the ASR. Please Note: The required photos for the Open Registry Application must still be mailed with the entire required packet following the instructions on the registry page.